For many years, awe-stricken tourists to the Grand Canyon have been fed a steady stream of uniformitarian propaganda designed to teach that the amazing chasm took six million years to form. Uniformitarian geologists, however, recently concluded that the "traditional" age of six million years has been incorrect. In fact, they suggest that parts of the Grand Canyon began to open "at least 17 million years ago" (Neergaard, 2008). As you can imagine, a discrepancy of almost 300 percent for the Canyon's age has gained international media attention. And it brings to light several glaring, irreparable problems inherent in the uniformitarian philosophy. First, it should be noted that if the new research is right, uniformitarian texts that have used the six-million-year figure have been glaringly incorrect for the past several decades. Thus, all those visitors who were taught the Canyon was six million years old were misinformed. If such "solid" dates can be adjusted upward so easily, should we not eye their accuracy as extremely suspect? If the Grand Canyon's age can be adjusted by 11 million years with one or two studies, could the age be adjusted by 5.9 million years in the other direction? And who is to say that in five or ten years, new "research" will not tell us that the Canyon is 30 million years old, or 100 million? Such outlandish dates are based on faulty evolutionary dating methods that have been proven to be inaccurate due to their reliance on unprovable assumptions. Neergaard reported that the research team responsible for the current age-adjustment used "uranium-lead isotope testing" to arrive at the new dates (2008). But uranium-lead isotope testing is known to render ridiculously exaggerated dates (see DeYoung, 2005). 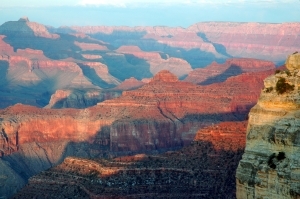 Geological structures in the Grand Canyon do not even point to a uniformitarian origin for the huge chasm. In fact, models that present a catastrophic origin fit the available evidence much more readily. Several books have been published verifying that such is the case, including Grand Canyon: A Different View (Vail, 2003) and Grand Canyon: Moment to Catastrophe (Austin, 1994). Evolutionary uniformitarians often point to "proven" ages of millions of years to "disprove" the biblical account of Creation. The recent research on the Grand Canyon shows us that such ages never were proven in the first place. Furthermore, the actual geological evidence shows that the entire philosophical approach of uniformitarian-ism is untenable. It is time we turned our attention back to the Book that will never change	the word of God. Austin, Steven (1994), Grand Canyon: Monument to Catastrophe (Santee, CA: ICR). Neergaard, Lauran (2008), “It Took Eons to Make Grand Canyon Grand,” [On-line], URL. Snelling, Andrew (no date), “The Fallacies of Radioactive Dating of Rocks: Basalt Lava Flows in Grand Canyon,” [On-line], URL. Vail, Tom (2003), Grand Canyon: A Different View (Green Forest, AR: Master Books).